Replacement spigots for the maintenance of your cherished wooden aging barrel. A wooden barrel spigot is something that will need to be replaced from time to time. 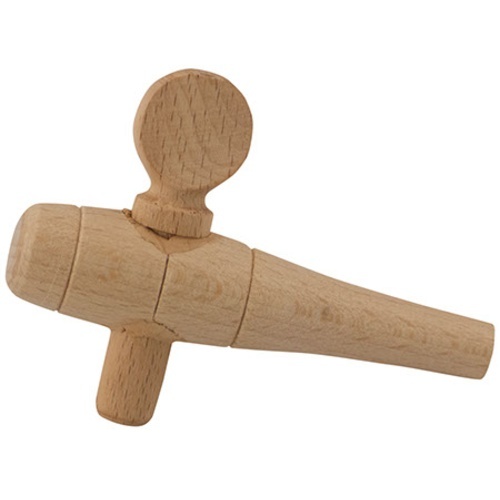 This wooden barrel spigot features a wooden handle and spout, and a rubber valve insert. Spigots are sold individually, with no packaging. The "6 cm" spigot is approximately 2-13/16" long. The shaft tapers from 9 mm (11/32") at the small end, up to 10.5 mm (13/32") wide. Note: Wooden spigots are made with natural wood and a rubber valve insert, and can leak or fail if not well maintained. The rubber insert should be inspected regularly to make sure it does not wear down during use. Inspect regularly and use with care.